The most important thing about the parenthood is to make their children handy and most responsible children. In order to attain their goal, they should start welcoming the important chores. Assigning of chores should not be tedious but simple that are suitable according to the children’s age. So that, when the kids reach the teenagers, they should have learned the skills and chores for young adulthood. The first skill that enhances the kid is the ability to plan by themselves. When the parents provide the list of chores to be done, the child will be capable to prioritize the allocated chores. This skill can be learned via the regular(routine) chores assigned by the parents. The recurring habitual of doing chores will develop the kid’s growth continuously. So that without having to be cajoled, the kids will be capable of doing their chores before even the assignment of chores. Through this children’s skill improves to listen, respond and respect their parents thought. Chore doesn’t mean only for the kids the parents or anybody can combine within the chore activities so that the children love to work more than the usual. This way of positive approach will build the positive skill set, which creates a flexible environment to work, share and help each other in a teamwork. Creating the necessity of routine chores will enhance the faithfulness for the kids in whatever work they do. For instance, watering the plants regularly makes the plant to live if not done regularly the plants might die. This kind of lessons should be taught during their chore activities so that the kids will get to know the importance of the routine chores. The more things fed during the earlier stage elaborate with more values. 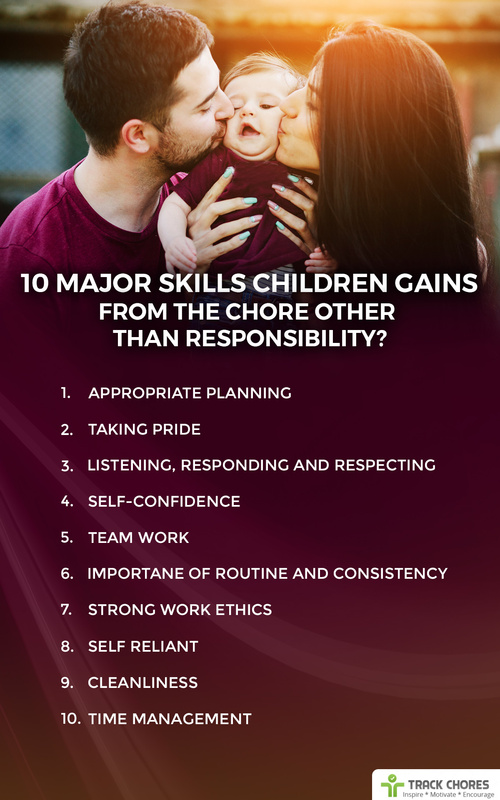 Children who are capable of doing the chores during their childhood will have a strong work ethics, once they enter into the world of young adulthood. This doesn’t mean only for the household chores, but they will learn any kind of work ethics. A non-reliant person is thousand worth than the reliant person. Once the children are practiced by their routine chores, they do not rely upon their parenthood to assign chores for them. They typically start by their own, which boosts their most required self-reliant skills. As everybody knows the main purpose of the household chores is for the cleanliness. When the children who are taught to do the chores in the earlier stage will learn to keep their surroundings tide and clean where they will have less troublesome in maintaining throughout their lives. I hope you would have understood the valuable concept behind the chores from the above-mentioned skill sets. Overall, this blogging states about getting the chores done by kids is not to burden them or to make them engaged in the extracurricular activities or just for the relief for parenthood. It’s all about to make children learn to do all the chores by themselves that will gain exposure(life’s mandatory skills) when they move into the world of young adulthood. Gaining all these understandings in the childhood will help kids to grow in well advanced and capable of becoming a successful adult. So do not say “No To Chores”, rather make them do it in a better way. It’s not too late, Why don’t you start to develop your kid’s additional skills?